Whether you choose beef or bison, you simply cannot go wrong with this Canyon Creek Burger from Ted’s Montana Grill that I recreated in my kitchen. 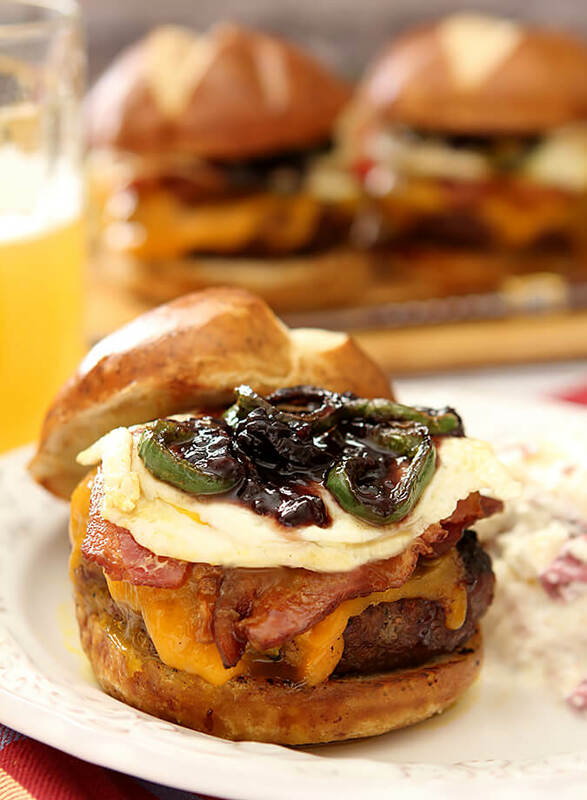 Beef or Bison served with cheese, bacon, fried egg, jalapeno, and jam. OMG Good! Last month when I visited Ted’s Montana Grill in the Denver Tech Center, I shared that experience here. Everything we sampled was SO good and the incredible hamburger I had for lunch left an indelible impression; The Canyon Creek Burger. Ted’s serves this burger using either bison or beef and I won’t deny; bison may be leaner and I suppose considered better for you but I love beef more! I knew I wanted to try and re-create this sandwich at home but it’s just taken a bit and maybe that’s prophetic. With Father’s Day coming I think everyone needs to just stop all of your wondering and worrying about the perfect gift for Dad and just head over to his house with ingredients in hand and make him this burger. I’m sure he already loves you but trust me…this will elevate that love to a new level! While you’re at it? 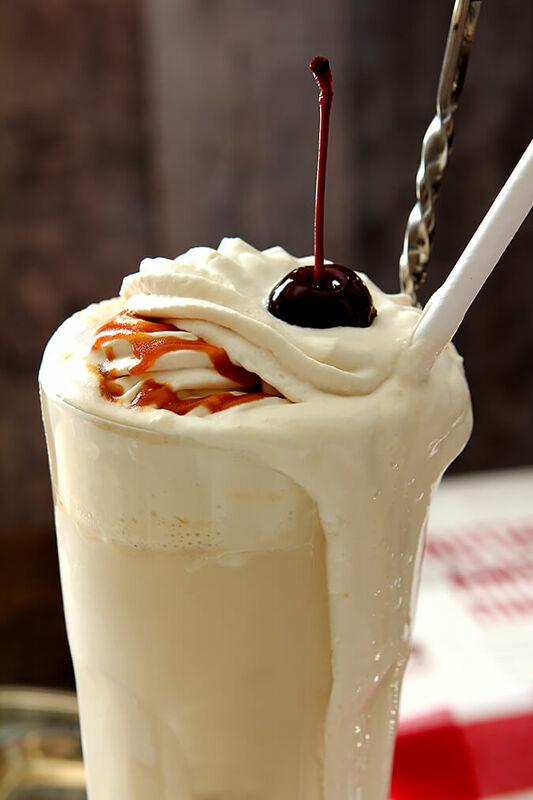 Make him this Boozy Salted Caramel Milkshake we had for dessert at Ted’s. Seriously. This is eye-rolling good. Ask everyone I’ve made it for; it’s moved to the very top of the request list. I should open an ice cream store/bar and serve nothing but boozy milkshakes. The combination of vanilla ice cream with salted caramel and bourbon is, well, to use an over-used phrase but one that really fits? To. Die. For. OK, back to the burger! Ted’s has a comprehensive menu with a great selection of appetizers and salads and lots of delectable lunch choices that run the gamut from steak to burgers to crab cakes. I headed towards the burgers because my daughter flips out over their Kitchen Sink Burger. 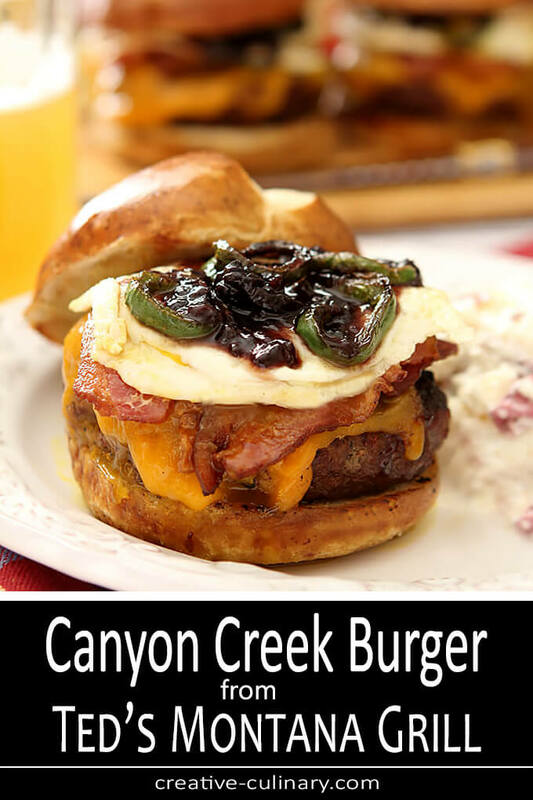 I took a peek at it and I’m sure that fried egg is a big part of the deliciousness but the other ingredients in The Canyon Creek Burger called to me loudly and loudest may have been the blackberry jam and jalapenos. There is a local company that makes a Blackberry Serrano Jam that I just love and I’ve often used it for appetizers so I knew that sweet/hot combination was great with more savory flavors. It was a done deal. I knew it would be good but I was especially lucky to have pound of ground beef on hand from my friends at 5280 Meats. A great burger deserves great beef and they do it best. Plus? No longer do you have to buy a whole or a half of a cow…smaller packages are available too. For people like me! I used that entire package too for two burgers. Two HUGE burgers topped with cheddar cheese, bacon, an over-easy fried egg and then some jalapeno rounds and dollops of the jam. Oh my yum. You know when you have those moments when something is so good you wish time would just stop? You just want to be able to savor every moment? That was then. And lucky for you (and me), I think I’ve done a good job of recreating that moment so this is now. Ted’s menu made it easy with ingredients and I only made slight variations. To concede to those who might not like quite the same burn from jalapeno, instead of dicing them I sliced them and briefly pan fried them to temper their heat. I would have used the proscribed Kaiser Rolls except that I could find none. My last stop at Sprouts only netted me some decent size Pretzel Rolls. I loved them so much that for me…this is what I’ll always look for now. It seems the bottom line is to just get a nice, substantial bun; this sandwich needs it! I’m not much of a beer drinker but I do love Guinness and was hoping I had some chilled in the fridge. Alas it was gone and I spied this bottle of Lemon Shandy. I remember agreeing to try it but for me, timing is everything and it was huddled in the back of the fridge. Good news Curious Traveler…this was the perfect time! A shandy is a cocktail that is a combination of beer and lemonade and I made this one last year and really liked it so I thought this might work for me too. Seriously? This is what I need to have in the fridge at ALL times. It was cold so I quickly stuck a glass in the freezer. I only enjoy beer that is bracing cold. It was seriously great with this burger. Clearly I’m a shandy girl if not a beer girl. Good to know, sometimes it’s nice to have a bottle of something to relax and savor without the necessary effort to make a cocktail. It’s on my radar and I promise I will have a 6 pack on hand when you next come visit. All of you must share. Make this burger or if you’re in a town with a Ted’s Montana Grill? Take Dad out for the day and let them do the work for you…either way it’s a winner. Love Burgers like I do? Here’s a few more! Fry the eggs in a skillet with a bit of butter. I prefer over easy but cook them whatever way is to your liking. Remove the eggs from the skillet, add a bit more butter and fry the jalapeno pepper rounds just briefly, no more than one minute per side until just wilted and starting to turn brown. The last minute of cooking the burgers on the grill, place two slices of cheese on each burger, close the lid and allow the cheese to begin melting. Remove burgers to a plate; put the sliced buns on the grill for about a minute, just to lightly toast the buns. 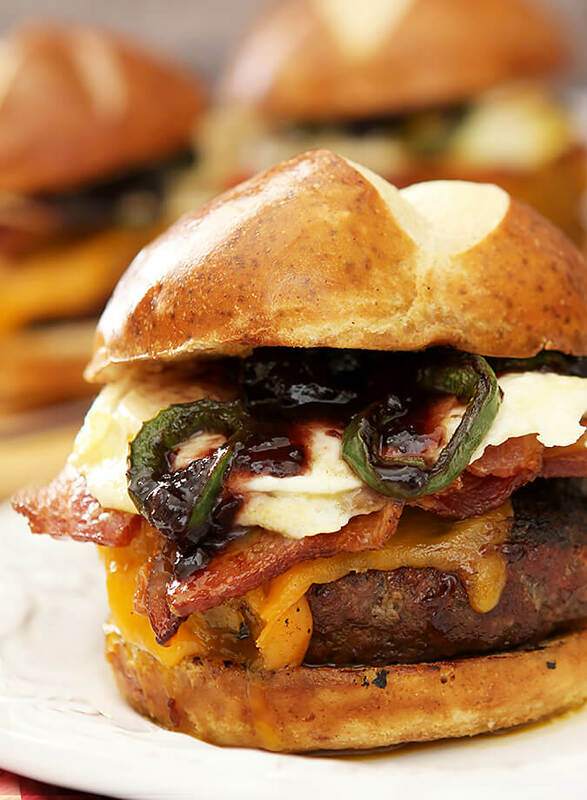 Put the burger with cheese on the bun bottom and top with the bacon and fried egg and then scatter some jalapeno peppers and a couple of dollops of blackberry jam. Top with the burger top and serve. 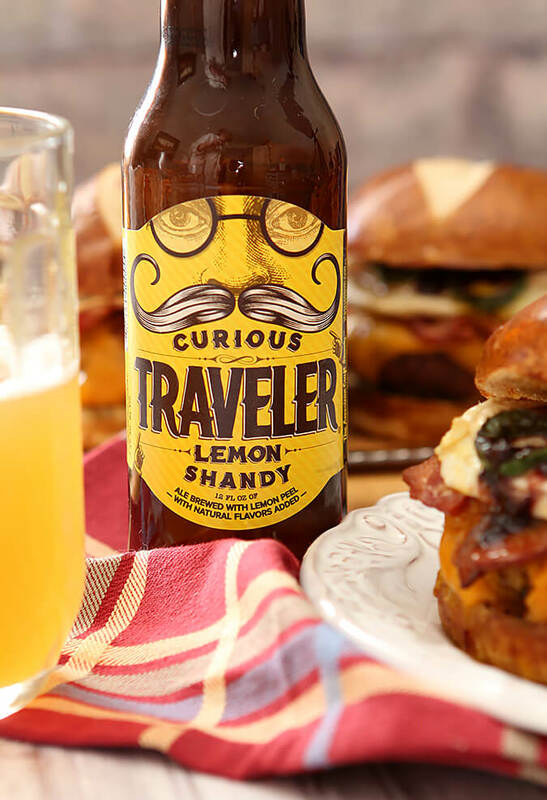 I was provided with samples of the Curious Traveler Lemon Shandy however all commentary is my own. Before he left the restaurant world, my son was GM of the Ted’s in downtown Atlanta. The care they put into their dishes is outstanding. Even the managers have to be able to chop like a professional chef. If my dad were still alive, he would love me more after one bite of this burger. WOW! This looks amazing. I have to put the blackberry jam on my next burger. That’s very creative. It’s sort of become my new favorite condiment; especially mixed with the jalapeno. This is simply a ridiculous burger in the best way possible! Any one of those toppings would make it special but you combined so much goodness together all in one spectacular meal. Impressive! This looks amazing and I know my husband would LOVE It! Simple enough but piles of flavour makes this a father’s day classic! Mmmm….what a yummy looking burger…and shake…and well everything! I never would have thought to use jam as a condiment and I bet is terrific! It’s a subtle surprise but a really good one too and yes it is yummy. And that shake? No Words. Really. Except to say I want one now. AMAZING burger recipe. I have never been to Ted’s Montana Grill but this burger looks like a great summer recipe. Blackberry jam? Sounds very cool. Jalapeno jam might be interesting too instead of the browned jalapeno, but I think I’d prefer your combo. Really good burger. I don’t often add fried eggs to burgers, but they are nice, aren’t they? Good recipe — thanks. I actually have some jars of blackberry serrano jam that I bought from a local vendor last summer. Yes I used that PLUS jalapenos but I like it spicy! The blackberry is so nice and thick and I think more complex than jalapeno jam (or jelly which is all I’ve had). It was just perfect!